-Ch 2 counts as dc. Fasten off after row 12. Turn hat wrong side out and position the seam in the center. Join daffodil at the corner and sl st along the edge to shut the top of the hat. Sew in ends and turn right side out. Attach White with sl st to beginning foundation chain. Row 1-5: Ch 1, sc in same and in each around. Join. Row 1-5: Ch 1, hdc in same and in each around. Join. Still using toffee. Lay hat flat with seam facing up, find the center and count over 9 stitches to begin first earflap. You should be leaving 20 stitches unworked in the back. Row 1: Hdc in 12. Ch 1, turn. Row 2: Hdc2tog, hdc in 8, hdc2tog. Ch 1, turn. Row 3: Hdc2tog, hdc in 6, hdc2tog. Ch 1, turn. Row 4: Hdc in each across. Ch 1, turn. Row 5: Hdc2tog, hdc in 4, hdc2tog. Ch 1, turn. Row 6: Hdc2tog, hdc in 2, hdc2tog. Ch 1, turn. Row 7: Hdc in each across. Ch 1, turn. Row 8: Hdc2tog, hdc2tog. Ch 1, turn. Fasten off and move on to next earflap. Count over 25 stitches from the last stitch in row 1 of earflap. Ch 1 and sc along entire edge, fasten off. The eyes are each made in 3 pieces and then stacked atop each other and sew together. Row 1: Magic circle, ch 2, 10 dc in circle. Join. Row 2: Ch 2, dc in same, 2 dc in next and in each around. Join. Row 3: Ch 1, hdc in same, 2 hdc in next. *Hdc in next, 2 hdc in next* Repeat *to* around. Join. Fasten off leaving long enough end to eventually sew on to hat. Pull magic circle tight and sew in that end only. Row 2: Ch 1, 2 sc in same and in next. *1 sc in next, 2 sc in next 2* Repeat *to*around. Join. Fasten off leaving long enough end to sew on to white part of eye. Row 1: Magic circle, 8 hdc. Join. Fasten off leaving long enough end to sew on to turquoise part of eye. Now sew black on turquoise then sew the turquoise on to the white. Sew on to hat. Row 2-5: Ch 1, sc in same and in each around. Join. Fasten off and sew end of nose shut, making sure not so make it pointy. Stuff nose with yellow yarn bits or poly-fil. Row 1: Ch 3, sc in 2nd from hook & in next. Ch 1, turn. Row 2: sc in same & in next. Ch 1, turn. Row 3: Sc in same & next. Fasten off leaving long enough end to sew on to hat. Ch 4, dc in 3rd from hook, dc in next. Ch 1 & sl st around 3 sides, chaining 2 at the corners. When you get to the last corner, ch 2 and work 4 dc all in the corner space. Ch 5, hdc in 2nd from hook, dc in next, tr in next 2. Make a chain of 24, cut yarn leaving a long end to sew on to hat. Make a chain of 70, leave both ends a little long. Use these ends to weave through the hat, do not do this tightly or it will change the sizing of the hat. Sew all the pieces on to hat as shown in photo, sew in all your ends. Using three long strands of toffee, daffodil & white each (9 strands total) make your first braid. Do the same for the other braid OR try only white braids then tie on a blue and a red piece near the bottom of the braid to look like socks! 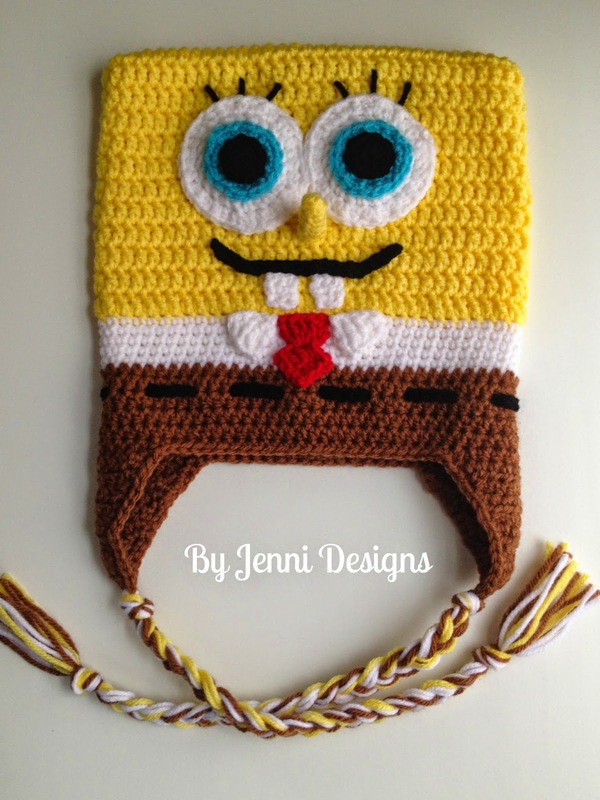 This is an awesome sponge bob, but what does it look like when worn? Does it stand too tall? 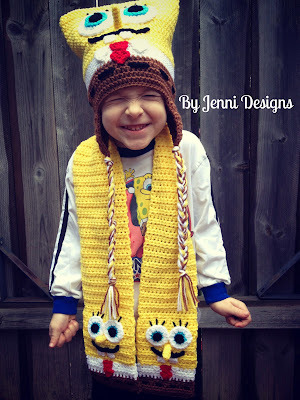 Thank you so much for the adorable pattern. 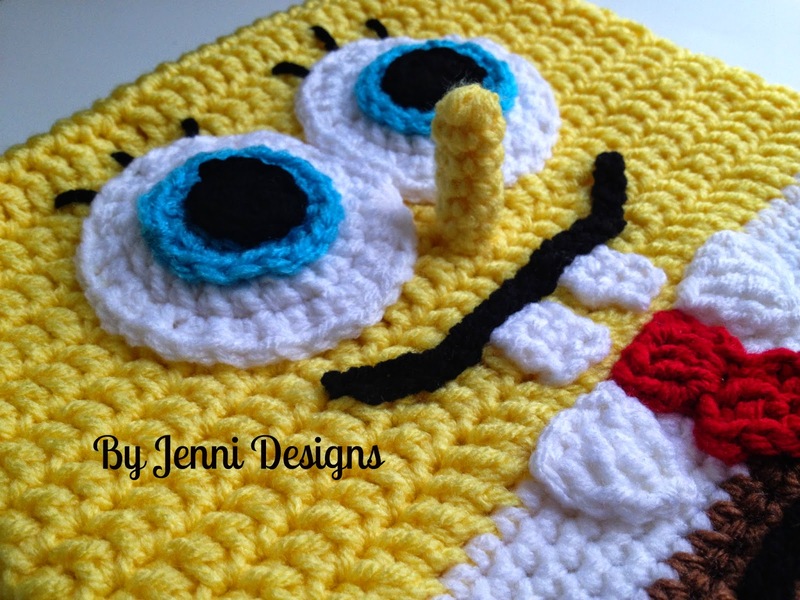 I crochet for charity and I'm always looking for something different and cheerful. You are very welcome Joey!